A general view shows smoke rising above a dock at the Zvyozdochka shipyard in the north Russian city of Severodvinsk Apr. 7. Firefighters struggled to put out a blaze on a nuclear submarine as it underwent repairs at a shipyard in Russia's northern province of Arkhangelsk on Tuesday, Russian news agencies reported. The agencies quoted sources as saying there were no weapons on board. 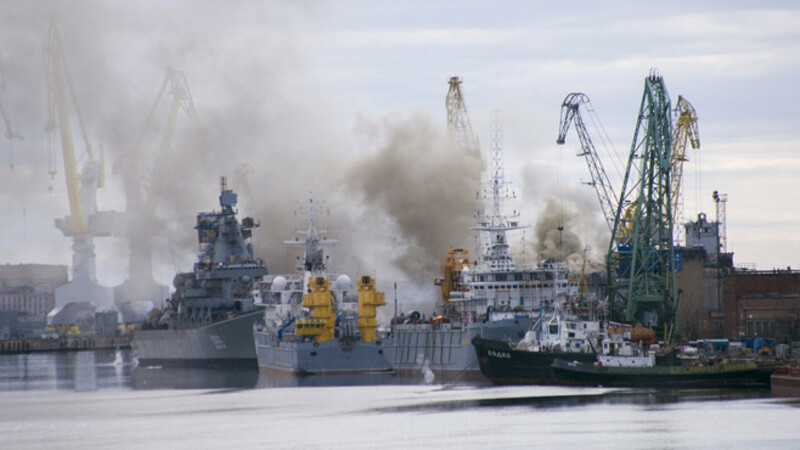 Nobody was hurt, they said, although the RIA Novosti news agency said the dry dock where the vessel was being repaired may have to be submerged under water to help extinguish the blaze. 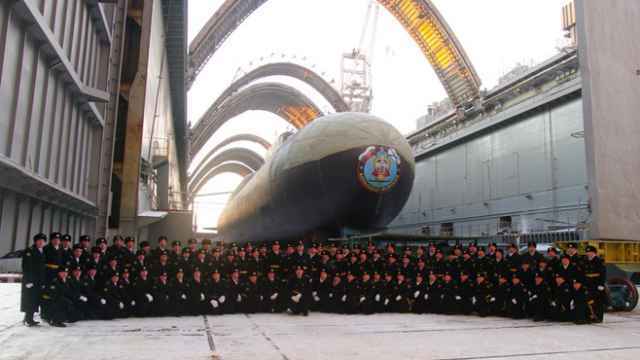 The Emergency Situations Ministry declined comment on the reports of the fire at the Zvyozdochka shipyard, where the agencies said the 155-meter-long (just over 500 feet) 949 Antei submarine was being repaired. 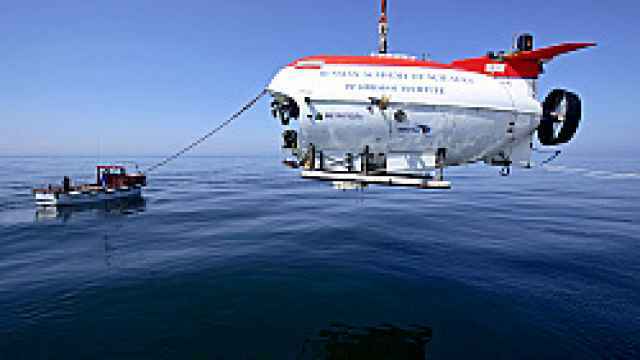 "There is a fire on the submarine. We are fighting the fire now," a shipyard source told the Interfax news agency. RIA quoted a shipyard spokesperson as saying there were no weapons on the submarine and a source told news agency TASS that the vessel's nuclear reactor had been shut down prior to the blaze. "The active zone of the reactor was unloaded at the start of repairs a few years ago," the source said. The news agency reports said the fire had started near the stern during welding work that caused insulation materials to catch fire. RIA quoted a well-informed source as saying it was proving hard to put out the blaze because of thick smoke. "At the moment they are 'attacking' with foam to try to put out the fire but it's not having any effect. 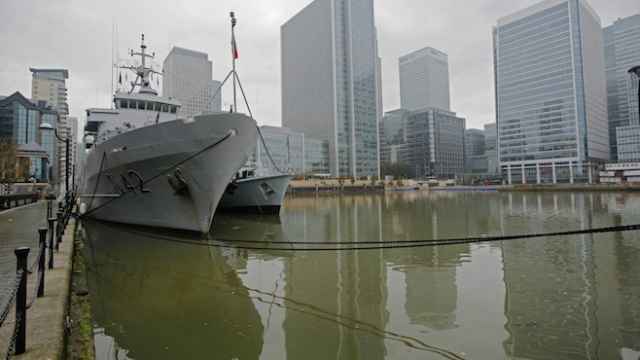 Because of this they are considering whether to fully submerge the whole dock under water," the source said. A similar blaze in 2011 nearly led to a nuclear disaster as a blaze engulfed a nuclear-powered submarine carrying atomic weapons, a leading Russian magazine reported months after the blaze, contradicting official assurances that it was not armed. Russia has a poor transport safety record. A trawler sank in icy seas off Russia's far eastern Kamchatka peninsula last week, killing at least 56 of the 132 crew members. 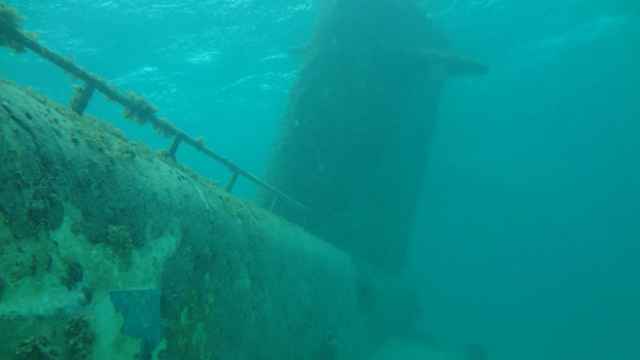 In August 2000, during his first term as president, Vladimir Putin faced criticism for not acting quickly over the sinking of a nuclear-powered submarine on which all 118 people aboard died.